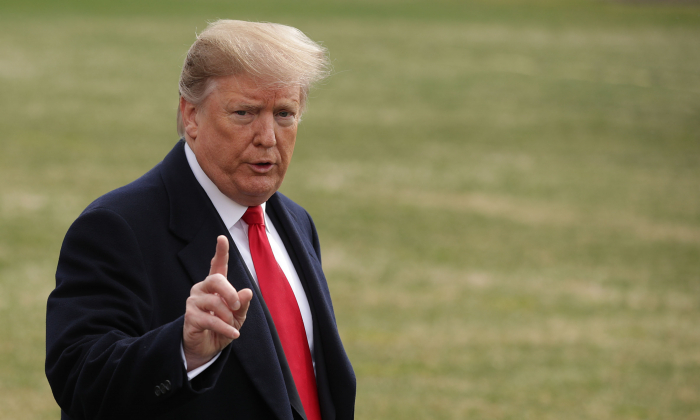 President Donald Trump intends to declassify all documents related to the surveillance of his presidential election campaign by the Obama administration. Trump revealed his intentions in an exclusive interview with Fox News on March 27. The president explained that he held back from releasing the documents while the special counsel investigation was still ongoing in order to avoid the appearance of obstructing the probe. The FBI obtained surveillance warrants to spy on at least one former Trump campaign volunteer, Carter Page, beginning in October 2016. The Foreign Intelligence Surveillance Act (FISA) warrant applications on Page have been partially declassified. The documents show that the FBI used the discredited Steele dossier as the basis of the rationale to surveil Page. The bureau failed to disclose that the Steele dossier was funded by the Clinton campaign and the Democratic National Committee. Former British spy Christopher Steele compiled the dossier by paying second- and third-hand sources with ties to the Kremlin for information. Steele was biased against Trump and did not want Trump to be elected president, another fact the FBI failed to disclose in the FISA application, despite being aware of it. Fusion GPS, the firm that hired Steele to run the Clinton-funded project, peddled the dossier to the media while Steele funneled it to the FBI. The bureau eventually terminated Steele for talking to the media in violation of its policies for confidential human sources. “Millions and millions [spent] on the phony dossier, and then they used the dossier to start things. It was a fraud, paid for by Hillary Clinton and the Democrats,” the president added. The president also denounced the officials involved in investigating his campaign, accusing them of committing “treason.” The president called former FBI Director James Comey a “terrible guy,” suggested that former CIA Director John Brennan is potentially mentally ill, and derided Democrat House Intelligence Committee Chairman Adam Schiff as a criminal. “It was treason, it was really treason,” Trump said in reference to former FBI Deputy Assistant Director Peter Strzok and former FBI lawyer Lisa Page. In text messages, Strzok and Page spoke of stopping Trump from being elected, discussed an “insurance policy” in the unlikely event he won, and mused about impeachment after his victory. The two officials were central in the “Crossfire Hurricane” probe of the Trump campaign that started in late July 2016 and then briefly joined the special counsel investigation by Robert Mueller. Mueller finished his 22-month investigation March 22, concluding that there is no evidence of collusion between the Trump campaign and Russia.